This week, Zimbabwean stand up comedian Carl Joshua Ncube revealed himself as Africa's Newest Late Night Show host with an upload of his brand new Television concept Late Night With Carl Joshua Ncube. The LATE NIGHT SHOW done in the style of the Daily Show with Trevor Noah is meant to be an interpretation of this American concept from Africa's perspective. Ncube shows his versatile comedy and quick wit in this showreel showing the need to have a LATE NIGHT satirical news show for the continent. Currently his version has a bias towards Zimbabwe but Ncube states that he intends to perform this style of show all over Africa using his writing and graphics/animation skills to put together content specific to many African countries. A move that that he states will end up with content that the whole of Africa can understand and enjoy. Carl Joshua Ncube feels that the African continent is full of content and it is important that the content produced is able to distill the complexity of Africa into a form the world can consume. At this stage the late night show will be done as LIVE comedy shows in various countries with broadcast discussion happening in various countries to make this African Television Show a reality. 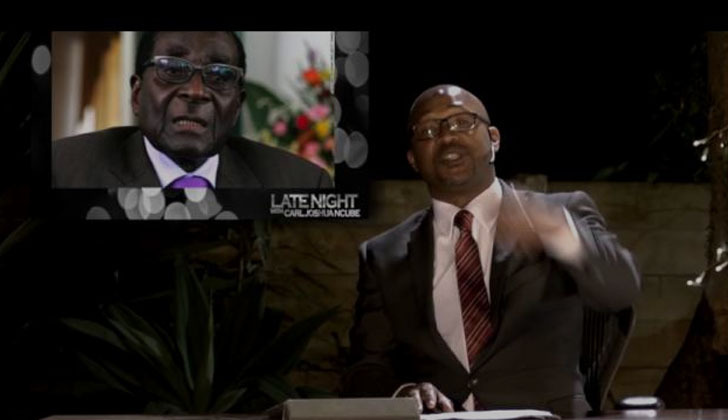 This version of Late Night With Carl Joshua Ncube features blogger and media practitioner Larry Kwirirayi, the first female animator in Zimbabwe Claire Dongo and Zimbabwean Comedian Doc Vikela. The show was filmed in partnership with MMX Productions in Zimbabwe and Carl is dressed by Jan Jam Menswear!